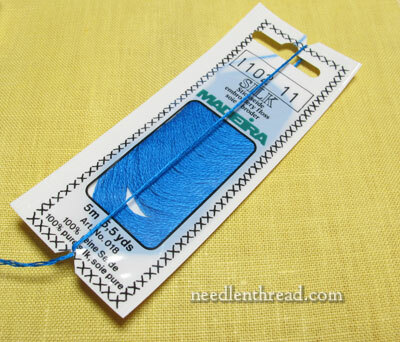 I’ve had a couple queries lately about Madeira silk embroidery floss – apparently, someone out there is using it in a class, kit, or chart. I can always tell when “something’s up” with a needlework product, based on the number of questions coming in! And so, today, we’ll have a little Thread Chat about Madeira silk floss. 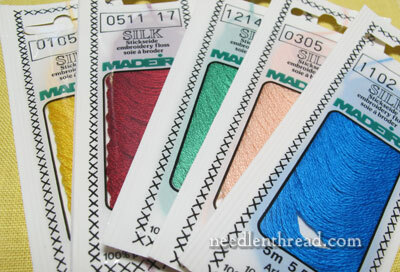 Madeira silk embroidery floss is a four-stranded, 2-ply, s-twisted filament silk floss that comes in 5.5 meter little packets. By four-stranded, I mean that it comes out of the package (“off the skein” – though it isn’t on a skein!) in a bunch of four threads that are lightly twisted together, and that are separated from each other for stitching, just as you would separate (or “strip”) cotton floss for stitching. By two-ply, I mean that each of those four strands is made up of two smaller plies of silk twisted together to form the one thread that you stitch with. 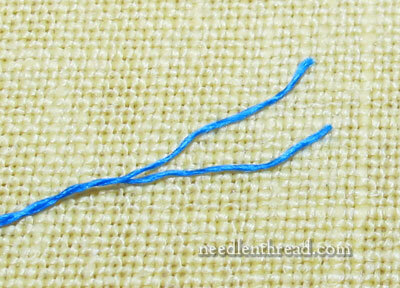 If you really wanted to, you could further separate the one thread into these two plies, and stitch with them. They are quite tiny. Each 2-ply strand is about the thickness of one strand (stripped from the six) of regular DMC cotton floss. “S-Twisted” means that each strand of two plies is twisted together in such a way that the twist follows (generally) the shape of an S as opposed to the shape of a Z. Filament silk can be either s-twisted or z-twisted. Most filament silk on the market is z-twisted, but some filament silk (Chinese silk in particular) is s-twisted. Filament silk is silk made from the suga or strands of silk straight off the cocoon. It is very strong and has a high sheen. 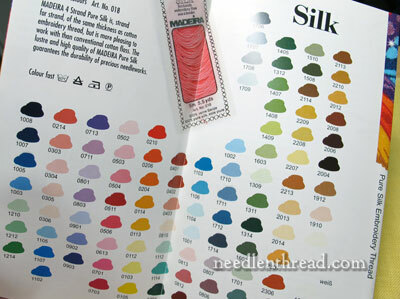 Threads like Soie de Paris, Japanese silk, and Chinese silk are all filament silks. While Madeira floss is somewhat unique in that it is not as common as z-twisted filament silks, in my mind what makes it most unique is its packaging. Madeira silk is packaged in flat little plastic sleeves that are sealed all around. 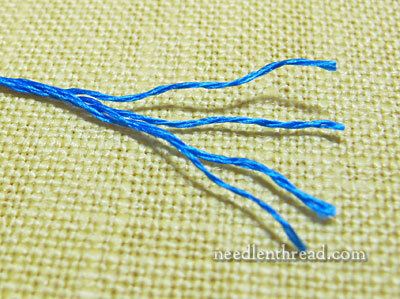 At the base of the sleeve, a strand of the thread is stuck between the two layers of sealed plastic. 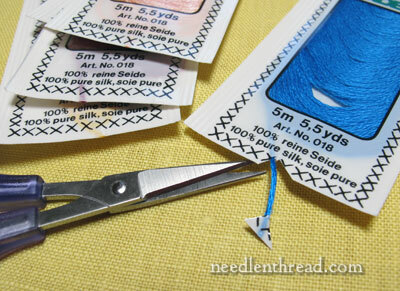 To use the thread and have a convenient dispenser, you snip the base of the sleeve in a little triangle, and then pull the strand through to cut off what you need. Although you can’t really put excess thread back into the sleeve, you can wrap the excess around the sleeve to keep it neat. Madeira silk floss comes in a nice range of colors, but not an extensive range – there are 108 colors available. Stitching-wise, Madeira is ok to stitch with, but admittedly, it doesn’t quite stand up to Soie de Paris (which is my all-time favorite filament silk floss). Stitching with Madeira reminds me of stitching with Chinese silk, although it’s a little tamer and more regular. Soie de Paris is smoother, has a better feel to it, and is generally flawless as it comes off the spool. Madeira silk is slightly less expensive than Soie de Paris. It comes in a 5.5 meter package and is usually priced around $2.25 / package. However, keep in mind when comparing prices that Soie de Paris (around $4 / 5 meter spool) is a six stranded thread, so you get approximately 50% more silk on the spool. You can find Madeira silk floss available in online shops through a simple search. Incidentally, Madeira silk is not to be confused with Madeira embroidery. Madeira, located off the west coast of northern Africa, is an island of Portuguese influence well known for its fine embroidery. Madeira floss is produced and distributed by a company in Germany. So interesting! I always learn something new from you. While on the subject of threads, I was wondering if you have used Gumnuts ‘Star’ threads? I have recently picked up a project that uses this thread and love it. Have you stitched with it and what has been your experience? I find it to be very easy to work with and it doesn’t kink or get tangled. Very helpful! It’s so nice to have a thread I have never used described . Best of all, I can go your search – type in a subject – and get your review on many threads that are new to me or get your “take” on those I love. I often read your reviews when purchasing a book or thinking about trying a new thread. Thanks!!! So happy to see this article. I have several packets of the floss that came with magazines as freebies. I’ve stashed them away, saving them for some day. I wasn’t sure what the floss was like, how it works up. Nice to know it’s similar to DMC. Just want to add that your info on S twist/Z twist was great. I enjoyed reading those articles when you first wrote them. Appreciate this in depth post on the Madeira threads and the refresher on the Z & S twists. “I am clever. I’m over clever really. I don’t know why? I don’t know all the numbers though because numbers don’t end. You know Nanna, when you learn something it goes into your head.” Phew! Thanks for the thread talk very useful, it looks an interesting thread especially the way it’s packaged. I use silk thread a lot and I would rather stay with Soie de Paris silk thread which I really like for the softness and the sheen of the silk and they stock such a wide range of colours. But thanks for sharing the information with us. Madeira isn’t an island “of Portuguese influence” – it’s PART of Portugal! Madeirenses are Portuguese nationals. Madeira has it’s own general assembly but it’s not an independent country. Hi, Jem – yes, that’s right. I worded that wrong………. Great post, Mary, very informative as always! And a great refresher on the twists! Thanks for the information on this silk. I just purchased a small amount of silk to give it a try and had wondered how to deal with the packet. I am planning my next project and wanted to know how you calculated the amount of silk or wool you would need to complete the project. I usually have to order supplies online and if I order too little, my project is on hold while I reorder or I order too much, it can get a little expensive. Any guidance would be greatly appreciated. Mary, I cannot thank you enough for all of your helpful information and tutorials! I have learned so much and am always excited to read your blog. Previous Previous post: Needle Tin Winners & Thanks!